Referred to as the ‘Godfather of Black British photography’, Burke (born Jamaica, 1951) is also a dedicated archivist and collector of objects relating to black culture in Britain. 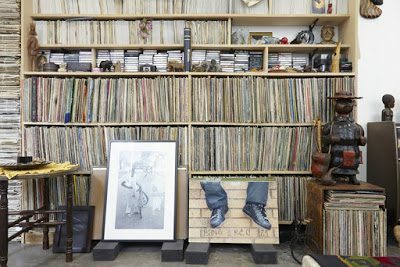 Ikon presents At Home with Vanley Burke, an exhibition of the entire contents of Burke’s flat in Nechells, north-east Birmingham. Indeed the entire first floor of the gallery is given over to almost the entire contents of Mr Burke’s flat; everything save his bed, his computer (a MAC) and his desk I believe. What follows is a reflection on what is a totally enthralling show – one that gives the viewer not only a unique insight into the artist’s world but also a glimpse into the everyday worlds of Britain’s African and Caribbean communities. 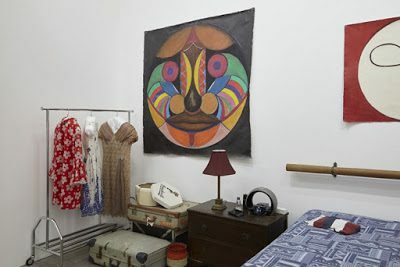 Entering the space, via a white-walled corridor in which paintings, photographs, posters and ‘African’ busts have been hung, the viewer immediately becomes part of what is essentially a living archive. This living archive shifts and changes in emphasis and energy, depending on who inhabits it. A large mirror at the entrance ensures that we are all included in the show as accidental exhibits, just as Burke himself becomes the subject of his own enquiry. As one moves through the space, the overriding feeling is one of being ‘wrapped in domesticity’; a particular kind of domesticity that is African Caribbean at it’s root but is connected to the basic human need for a sense of home, for a sense of belonging. But it is not only the distinctive décor that places this space within our community; the near constant soul, ska and reggae soundtrack emanating from the stereo in Burke’s living room provides an unmistakably Caribbean diaspora pulse. Walking from Burke’s reconstructed office, to the front room, to the kitchen and back, I was reminded of Walter Benjamin’s meditation on the packing and unpacking of his library. In his essay Benjamin considers the relationship that a book collector has to his books. 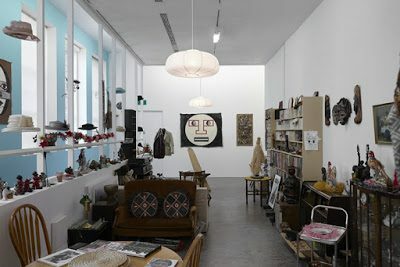 He suggests that the act of collecting is of equal importance to the collector as the collection itself; the act of acquiring possessions linked as it is, according to Benjamin, to memory. The ‘poles of order and disorder’ that the collector attempts to straddle by creating order out of the chaos of books, in Benjamin’s case, parallel our attempts as Caribbean migrants to hold the tension between attempting to settle in a new homeland and the longing to return to the old one, whilst all the while navigating a ‘Mother Country’ that did not always welcome us as a good mother should. 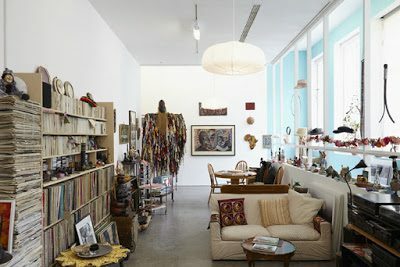 The fastidious tidiness of the piles of VHS videos, the towers of newspapers, the books, souvenirs, trinkets, golliwogs, shackles and other ironmongery relating to enslavement, not to mention the many photographs, carvings, collages and paintings, seem to create a precarious order out of such disorderly emotions. As curator Watkins concludes; Vanley Burke’s home truly is a ‘cabinet of wonderful curiosities’! Christine Checinska, 26th August 2015 All rights reserved. Images courtesy IKON Gallery  Text from IKON exhibition guide  Furthermore, on the day of my visit I was served tea in the ‘kitchen’ and challenged to a game of dominoes by the artist.